Exclusive 6 acre grounds provide intimate, private setting. Northern Florida’s climate allows you to enjoy the outdoors year-long. Designed for comfort and beauty and established by a physician dedicated to health and well-being. Friendly, professional management with the personal touch of a family-owned facility. Dr. Macarena Carretero has worked as a physician and professor in the field of women’s diagnostic health since 1980. In her close relationships with patients, she witnessed the role of stress in the development of illness and the recovery process. As a result, she became involved in teaching mindfulness-based stress reduction after completing an intensive course, internship and a teacher’s intensive program at Omega Institute and at the University of Massachusetts Medical School training with Dr. Jon Kabat-Zinn and colleagues. The idea behind mindfulness is to increase our awareness in order to relate directly and honestly with the realities of each moment. This awareness allows us to approach our life experiences with a sense of perspective and meaning and to make decisions with clarity and courage. The process of self-inquiry and understanding allows us to re-discover our inner resources to deal with the sources of pain, discomfort, illness and stress of every day life. Dr. Carretero has had a long record of volunteer service with several organizations including the American Cancer Society, La Liga Contra el Cancer, Florida Breast Cancer Coalition, the Commission on the Status of Women of South Miami, Hospice Vitas, and the Wellness Community of Greater Miami. As an extension of her commitment to promoting health and healing more holistically, she also began facilitating workshops on mindfulness-based stress reduction for cancer survivors and their caretakers. She purchased what has now become Casa Micanopy as a place to be still and enjoy the rhythms of nature and also with the dream of building a retreat center to share with others. Six years later, the dream was realized when the horse stable and surrounding grounds became Casa Micanopy, consisting of a spacious facility designed as a retreat center overlooking 6 acres of landscaped and natural scenery. 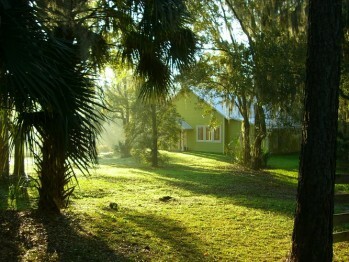 Dr. Carretero decided to open Casa Micanopy to groups seeking a natural environment that is conducive to contemplation, awakening, and healing.